Omaha Steaks Review: How Good Is This Mail Order Steak Company? Having been around since 1917, it’s safe to say you’ve probably heard of Omaha Steaks. The company started out in Omaha with just a brick and mortar store, but has grown tremendously since then. By 1953, they were offering a delivery service that sent steaks straight to your doorstep. That’s something that was pretty unheard of back in the 50’s! Fast forward to today, meal delivery services have become incredibly popular and Omaha Steaks is still in on the game—making them one of the oldest meal delivery companies. While they started out by just offering steaks, they now provide customers with a wide array of meats, side dishes, and even desserts. Their online shop gives you so much to choose from, making it a great place if you’re looking to order quality meats. If you’re thinking about trying Omaha Steaks for yourself, we’ve got the scoop on everything you need to know about their delivery service. To get started with your first order, all you have to do is figure out what you’re looking to buy. You can sort through their available options on their top navigation menu on their site. It shows everything they have to offer their customers. On that navigation menu, you will find: Steaks, Meats, Seafood, Meals & Occasions, Starters & Sides, Desserts, Wine, and BBQ. You can refine each of those options to see exactly what you’re looking for, whether it’s gourmet burgers, sausages, roasts, poultry, or ribs. They have a lot of food so if you get lost in their menu bar (which is pretty easy to do) just use their handy search box. One thing we especially liked about their ordering process is the fact that they allow you to order different amounts. You’re not just stuck ordering massive amounts of food, you can try them out by ordering a little too. It should come as no surprise that Omaha Steaks offers steaks for purchase online. You can view their available options by cut and speciality to ensure you get exactly what you want. For example, they offer steak cuts such as: filet mignons, strip steaks, top sirloins, flank steaks, prime rib, and more. They even have high-end grass-fed beef, bison steaks, chicken fried steaks, and other options in their speciality category. Besides steaks, they also have almost any other kind of meat you imagine. This includes: gourmet burgers, franks and brats, sausages, bison, veal, lamb, roasts, poultry, pork, ribs, and bacon. It’s basically a one-stop-shop for all of your meat-eating needs! To round out your meal, they also offer starters and side dishes, as well as tasty desserts for those with a sweet tooth. Their available starters include appetizers like: All-Beef Meatballs, Gourmet Franks in a Blanket, Ground Beef Sliders, and Filet Mignon Spring Rolls. They even have seafood appetizers like Coconut Shrimp, Lobster Bisque, and New England Clam Chowder. For side dishes to pair with your entree, Omaha Steaks offers cooked vegetables, potato sides, soups and stews, and even some speciality items. You’ll find the following on their menu: Roasted Root Vegetables, Green Bean Casserole, Asparagus Spears with Hollandaise Sauce, Stuffed Baked Potatoes, Whipped Sweet Potatoes, Aged Cheddar & Bacon Gourmet Tots, and Five Grain Rice Pilaf. And for those of you who are interested in desserts, listen up! They have cakes, cheesecakes, pies, tarts, cookies, and brownies for you to enjoy. You’ll find Sticky Toffee Pudding Cakes, Individual New York Cheesecakes, Chocolate Lover’s Cake, Caramel Apple Tartlets, Pecan Pie, Chocolate Chunk Cookie Dough for baking, and so much more. Before you rush off to place an order, you’ll also need to make sure you’re in the delivery area of Omaha Steaks. Residents of the United States, Canada, Puerto Rico, and the U.S. Virgin Islands can all place and receive orders. Unfortunately, they are unable to ship internationally due to import-export restrictions. At this time, Omaha Steaks uses UPS to handle all of their shipments. And if you choose their standard shipping option, you can expect your order to be delivered within seven to 10 business days. Sometimes delivery may take less time, so you’ll want to keep an eye on your tracking information to be sure when your order will arrive. They do offer Express and Rush delivery options if you need your shipment to arrive sooner. The good news is, you don’t have to be home to accept your delivery. UPS will leave the package at your front door, so everything will be ready when you arrive home. This is ideal for anyone who is typically out during the day and can’t be home to receive deliveries. 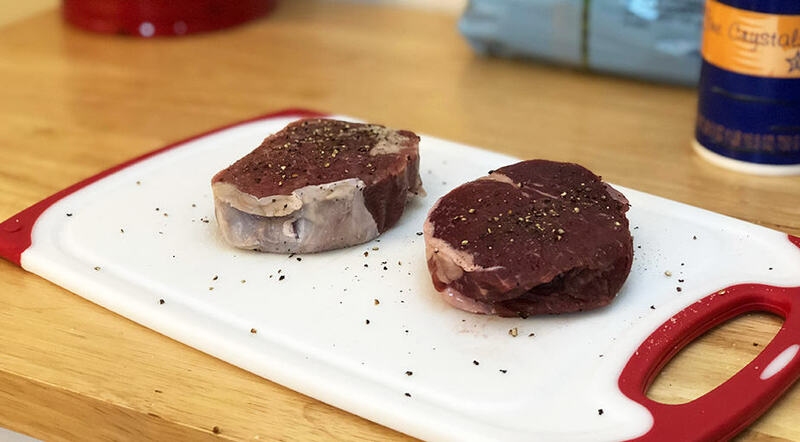 To ensure your order arrives to you safely, Omaha Steaks uses their “Mini Deep Freeze” packaging. 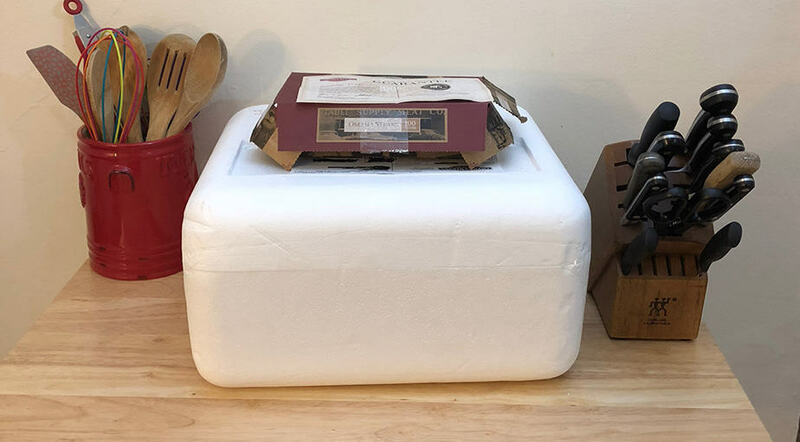 This is designed to keep all of your meat and side dishes frozen, so there’s no need to worry about anything spoiling before it lands on your doorstep. All of your items will be packed inside an insulated cooler made of polystyrene. There will also be dry ice inside the cooler, which keeps everything cold during transportation. You’ll want to make sure you handle the dry ice properly when removing everything from the cooler. It can be harmful to your skin if touched. While it’s certainly an effective means of packaging, it’s not the most environmentally-friendly. Not all recycling centers accept polystyrene, so you’ll have to find a local facility that does if you want to recycle it. You should be able to find this information online or by making phone calls to the recycling facilities nearest you. On the other hand, you can always keep the cooler and reuse it yourself. Honestly, it could really come in handy for taking to picnics or even trip to the beach. You’ll also notice a packing list on the lid of the polystyrene cooler. This packing list details all of the items you’ll find inside. Once you’ve opened the cooler up, all of your meat, side dishes, and anything else you order will be there. There will also be an instruction sheet with tips on cooking your meats to perfection. This is a great little additional detail we found helpful during the cooking process. keep everything frozen as it makes its way from their warehouse to your home. Nothing should have spoiled during this time, thanks to the cooler and the dry ice. If, however, you receive an item that you are not happy with, all you need to do is contact them. They offer an “Unconditional Guarantee” where they promise to replace the item in question or refund your money. It’s totally up to you which option you’d like, which is an added bonus. The thing about Omaha Steaks is that they’re not here to provide you with a pre-made meal or recipes to choose from each week. Instead, you’re basically in charge of crafting your own meals. They will provide you with directions for preparing each item in your order. However, they’re not set in stone. You can choose to cook the meats any way you please and they should come out just as delicious. Of course, just don’t under or over cook them. If you are looking to prepare a meal for a special occasion, they have some fun options that we haven’t seen from other similar meat delivery companies. Omaha Steaks allows you to order meals based on the occasion you’re celebrating, whether it’s a casual game day, Valentine’s Day, a birthday, an anniversary, or just a special dinner to say thank you. These already designed meals typically provide you with meat, a side dish, and sometimes a dessert. There are tons of different meal options to choose from. Don’t worry, when ordering one of these special entrees, you’ll still receive all the directions you need to make your meal. You will, however, want to have some key spices and cooking oils on hand just in case they are needed for your recipe because Omaha Steaks doesn’t provide you with any. 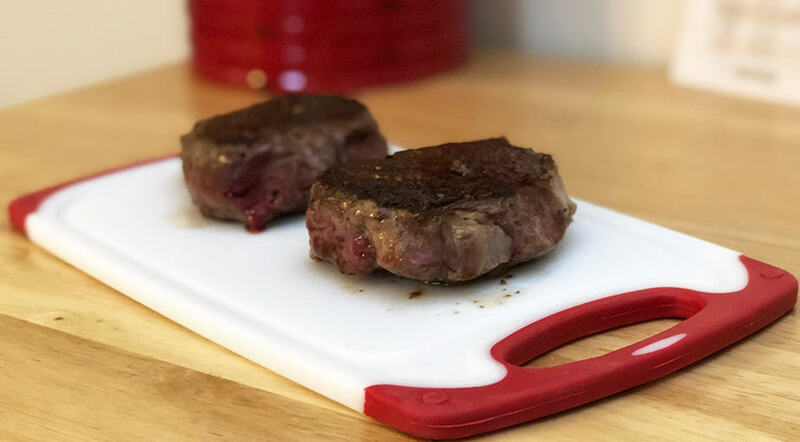 Since Omaha Steaks has been around for such a long time, it’s safe to say they know what they’re doing when it comes to high-quality, delicious meats. 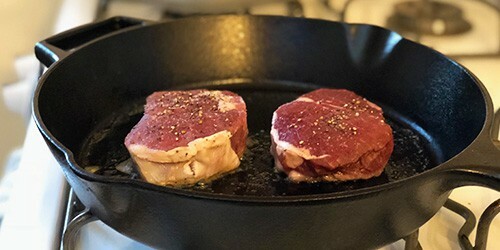 For this review of Omaha Steaks, we decided to order their most famous product: filet mignon. Neither Emily or I are big steak lovers so we weren’t expecting much. We cooked it in a mushroom sauce just to add a little flavor to the meal and some green beans. Initially, we thought we undercooked the steak because it came out slightly redder when cut. Turns out it was cooked just right—rare to medium rare. I’m not exaggerating when I say that we both looked at each other said this was the best filet mignon we’ve ever eaten. The steaks came out incredibly. They were so juicy and tender it was like they melted in our mouth. And although the mushroom sauce wasn’t part of the Omaha Steak order, it made the meal even better. Different types and cuts of meat will have different prices. And it ultimately depends on how much you put in your shopping cart. For example, if you want a simple filet mignon, it’ll cost you $8.96 each for a 4-ounce cut. If this sounds like a lot for a little, consider that you’re getting some of the highest quality filet available on the internet. When factoring in pricing, you’ll want to keep shipping costs in mind as well. For orders up to $69.99, it costs $17.99 for standard shipping. If your order costs up to $129.99, shipping will be $19.99. And for orders that are over $129.99, you’re looking at a shipping charge of $21.99. They do, of course, offer faster shipping options which includes Express, Rush, and Saturday Rush. Those cost an additional $19.99, $39.99, and $49.99 respectively. Overall, Omaha Steaks is a really great option to consider for someone who wants to eat the best meats around. Because they have so much variety, it also makes for a really great gift. They’re also a reputable company who stands behind their products with a very respectable satisfaction guarantee. That means if there’s any issues with your order at all, just let them know and it will be taken care of immediately. 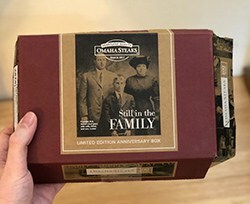 The only downside of Omaha Steaks is their packaging. It’s one of the least environmentally-friendly that we’ve seen. 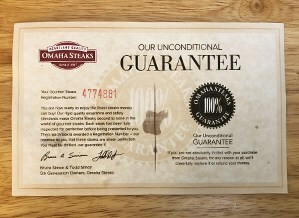 However, if you’re able to recycle it or even reuse it, I definitely suggest trying Omaha Steaks as they’re one of our favorite high-end mail order steak companies. Have a question we didn’t answer about Omaha Steaks? Feel free to leave a comment below and we’ll answer it as soon as possible!